Apart from the film work, presenting, and TV appearances, Dexter has a fair bit of voice over work under his belt. He has been the voice for McDonald’s television adverts and (feigning a US accent) is the narrator of The Game audio book written by Neil Strauss. He also narrated the Five series Airforce Afghanistan. So we come to what Dexter really wanted to talk to us about – his big project of the moment which is likely to jettison him into the archives as not only a great actor and superb voice artist, but as writer and director of a pretty awesome movie. Yes folks – the child actor, with the awe-inspiring American accent, turned cockney geezer character actor for hire, …..has pulled it out of the bag. Huzzah! Wild Bill is certainly funny, but also smacks with emotional impact and depth. In fact Dexter’s directorial debut is a complete charmer with a very likeable central performance from Charlie Creed-Miles as ‘Wild’ Bill Hayward. Released from prison after an eight-year sentence, Bill returns to a South London estate planning to stay out of trouble, serve out his parole and then head to Scotland. But he cannot easily escape his history with the dodgy geezers and dangerous drug dealers on the estate, or his obligations to fifteen-year-old Dean (Will Poulter) and his younger brother Jimmy (Sammy Williams). Nick, Andy Stanson, and Chris were all privy to the obvious excitement coming from Dexter as he chatted about the release of his film in the Green Room – and who can blame him – Wild Bill has already had rave reviews from tough critics and proves that Baby Face has finally become a critically acclaimed man! Regular readers of the A1 VOX Blog may remember us having a very fun session with David Walliams. He visited A1 VOX having just completed his swim of the Thames and raising £1 million for Sport Relief. 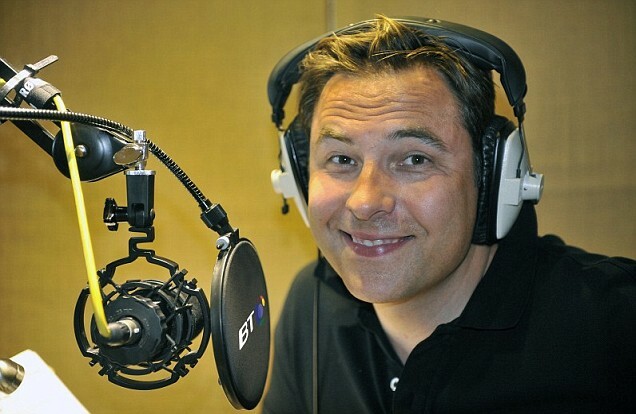 The comic, turned charity hero, came into our humble studio to lend his voice to BT’s Speaking Clock. I can now tell you that this has gone live, and for the next five weeks David will join Chris Moyles, Girls Aloud singer Kimberley Walsh, Gary Barlow and presenter Fearne Cotton to give the nation the time of day. All the above, (with the exception of Gary Barlow), recorded their pieces at A1 VOX the year before last and we feel proud to have done our bit towards the cause. David said ‘I was relieved to hear that BT only wanted my voice this time around and not for me to take on another grueling challenge’. So what can you do to help raise money – simply by ringing 123 from a BT landline until April 9th is what. Callers can also take part in a daily prize draw to win a limited edition David Walliams clock and not a kerfuffle in sight. The Great Gatsby, by F. Scott Fitzgerald. adapted by Peter Joucla, designed by Lucy Wilkinson. Published in 1925, a year before the catastrophic collapse of the American stock markets, Fitzgerald’s novel graphically portrays a society being destroyed by money and dishonesty, an American Dream of happiness and individualism degenerating into the mere pursuit of wealth. This particular production is an adaptation of the book for the stage and will be filled with live jazz music from the twenties, recreating the glitz and decadence of the period. “It takes two to make an accident.” But I doubt Joucia and Wilkinson will put a foot wrong in this daring project. The rooms at the front of Wilton’s will be converted into various places, inspired by the book, before the show from 6pm, during the interval, and after the show until 11pm, with live singing and dancing to boot. “I believe that on the first night I went to Gatsby’s house I was one of the few guests who had actually been invited. People were not invited–they went there.” And don’t you wait to be invited – get involved people! Audiences will be encouraged to stay and enjoy the whole experience. There will even be period food, merchandise and dressing up accessories to keep the 20’s vibe alive. So from Fat Sams Grand Slam to Wilton Music Halls very own version of the Speakeasy. I for one am tres tres excited about this whole project as I simply adore the roaring 20’s – flapper girls, bootlegers, and moonshine in teapots – what an era! To have one of our own starring in it completes the magic and I think that the A1 VOX’ers will be coming out in full force to support Nick as he sashays his way through what is sure to be a once in a lifetime theatrical experience! Darn Tooting! For more information and to buy tickets, call the box office on 020 7702 2789. Next week I will be chatting to Philippa Starns and Fenella Fudge to give you the low down on all that VoxTraining has to offer. Ta-Ra for now.